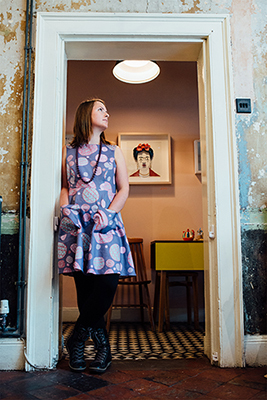 When I launched my business, Tenacious Bloom I started off designing and making screen prints and porcelain jewellery. I had experimented with simple prints on fabric but mainly onto paper for limited edition art prints. I loved the idea of making a dress with an all over pattern, which I could wear to events, which would reflect my brand. I wanted something simple, wearable and unique, a fabric that suited my style. When I spotted Woven Monkey on Facebook I ordered a fabric swatch book straight away and was very impressed with their speedy delivery! Not long ago I took part in MATS Bootcamp by the fabulous US based art agent and teacher Lilla Rogers and a few projects in we had a bolt fabric brief. It was the perfect opportunity to pursue my project. 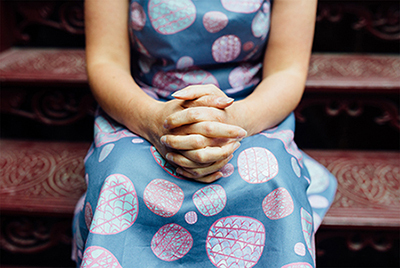 I had also found a great dressmaker Handmade by HollyCrow and so I set about adapting my original design into a more wearable print so that Holly could make me a dress. I love fabric but I’m definitely not a seemstress! Initially I drew the icons (individual part of the design) on paper with fine liners and pencil. I like to work in black and white to start with. Next I scanned them into my computer and cleaned them up using Photoshop as any little bit of drawing that wasn’t supposed to be there would multiply over the pattern as a whole. Once I had laid out my basic design I setabout adding colour to the icons. My original design was more of a children’s print so I removed a few of the icons and rearranged the layout and gave the pattern more movement. I then played with scale and mocked up how it might look on a simple dress shape, all in Photoshop, by overlaying a cut out of a dress shape. 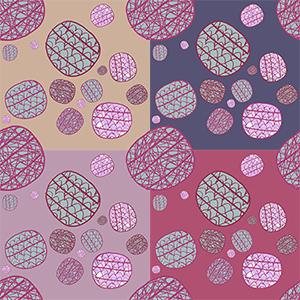 Once I had chosen the design I selected a small number of different colourways and changed the background so that I had 4 different designs to choose from. I used the file specs that Woven Monkey asked for and made sure my designs were saved in the correct format for upload. I found the process simple and straightforward once uploaded I was able to play with the scale and the guides allowed me to visualise how it would look. I researched the best type of fabric for the project I was doing then and by referring to the swatch sample booklet I had purchased before. Next I ordered swatches of my pattern in different scales and colours to make sure the eventual colour and scale was right. I was really impressed that the colours were very true to those I had been working with on my screen, the swatches were great quality. 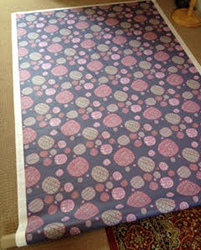 I was very excited to choose the one fabric I would have printed in a larger quantity for the dress to be made out of. I asked a friend to help choose the best colourway for my skin tone before submitting my order. The 4 metres of cotton sateen I ordered arrived was well packaged on a roll with a protective film and strong brown paper outer layer. It was very exciting to see my design in reality in a large volume! I took it to my dressmaker ready for pattern cutting, we had previously discussed the style and shape of the dress and she had taken my measurements, and come up with the overall design together from my specifications. Holly was super impressed with the quality of the fabric. She uses many different types of fabric in her work including lots of vintage fabrics so she really knows her stuff. She said it would be suitable for lots of projects from clothing to homewares such as cushions. When I tried on the final dress the fabric had excellent drape, perfect colour strength, the fabric required no lining on the skirt as the fabric was a great thickness and not see-through. I was so happy with the result! Holly’s clever cutting meant that there was enough fabric to make another outfit to come later in the year when Holly is less busy outside of the mega busy wedding season.